Are we born with our personalities and impulses? Or does our upbringing determine who we are and what we become? The GRAM’s Nature/Nurture exhibit challenges viewers’ ideas of self and identity. See all the artwork showing at the GRAM on the ArtPrize website. 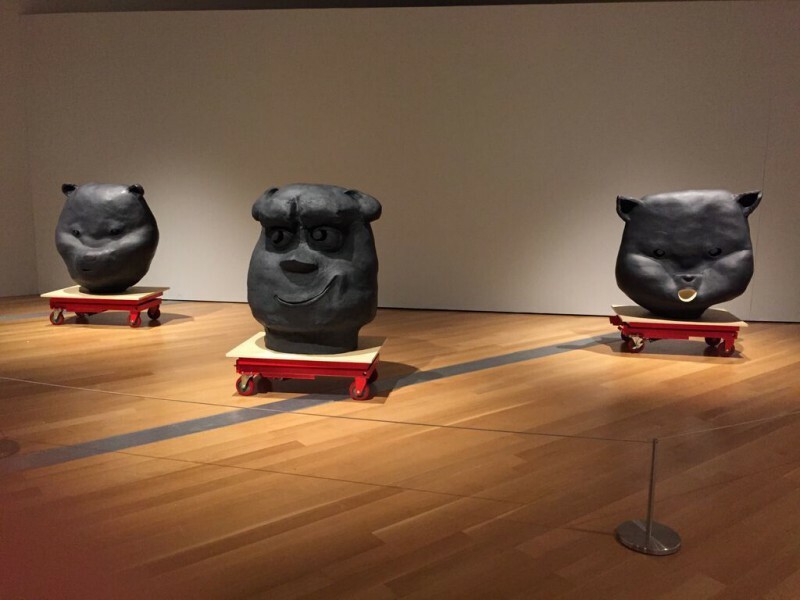 This week the Grand Rapids Art Museum (GRAM) released a sneak peek of their Nature/Nurture exhibit for this year’s ArtPrize. The collection includes work from 15 artists from across the country, ranging from 10’ diameter oil on canvas to custom bicycles and fingerpaintings. Notably, for the second year the GRAM’s exhibit includes a local Grand Rapidian, Monroe Aki O’Bryant, with his dramatic photo essay exploring racism and economic inequality in our own backyard. It’s a fascinating question to pose in a city full of both those who were born to privilege and those who are without. ArtPrize Seven at the GRAM has been curated by Ron Platt, who is new this year to both the GRAM and ArtPrize. “I love the binary aspect of the nature / nurture conversation,” Platt says, a preference you can see in the diversity of the artists he’s collected. “I suppose one of the reasons I’m so interested in the subject is because I was adopted, and I’ve always been fascinated by the idea of what makes me who I am,” he says. CEO Dana Friis-Hansen says the Nature/Nurture conversation is tied in to the Grand Rapids community, and ArtPrize season, because Grand Rapids is changing and growing, as is art appreciation. ArtPrize Seven at the GRAM has slightly fewer artists than in years before, and the spaces are laid out more openly, with plenty of room for the inevitable masses of ArtPrize-goers. The works also feel like less of a spectacle than they have been in the past (giant glass flowers, I’m looking at you), focusing more on their subject and less on blatant crowd appeal. Maybe it’s just because I’m a sucker for the Nature/Nurture conversation myself, but the works in the GRAM’s exhibit this year feel more connected. Collages pulled from childhood textbooks; a photo essay of National 4H Best in Breed winning chickens and bunnies; a large-scale oil dahlia; a silent video of a struggling seductress/mother: all these feel relevant to one another, despite the broad arc in subject matter and medium. Judith Braun’s site-specific charcoal fingerpainting is an obvious standout. The symmetrical work, given dimension by its corner location, is a dreamy fantasy of flowers, stars and shapes. Small, dressed in sharp black and full of angles- not unlike her work- Braun explains that this is her 26th site-specific fingerpainted wall. It’s obvious that her honed craft is ripe for a Top 20 nomination. Modernists will likely be drawn to the coloring book-like series by John Bankston ("The Explorer"), or Jetshri Bhadviya’s silent video of herself writhing in a silver bodysuit ("Manifestations of the Ipseity"). There are treasures here for genealogy lovers, like Carlee Fernandez’s "Arranging Family," a multi-media work including a giant cast bronze baptismal cup based on the combined mass of the artist and her nuclear family; or Parisa Ghaderi’s photo and text exploration of the loss and alienation she experienced since emigrating from Iran. Krista Schoening’s 10 foot diameter circular oil on canvas "Karma Dahlia II" is displayed against the GRAM’s east-facing glass walls, where it’s sure to draw attention from ArtPrize-goers on the street - another possible Top 20 candidate, considering the public vote’s preference for dramatic, large-scale entries. Some of the most socially important work in the exhibition, however, is happening in its photo essays. Many will likely find the subject matter in Grand Rapidian Monroe Aki O’Bryant’s "A Fearless Brother Project Presents: Realistic Neglects - A Graphic Series by Akibang" difficult to grapple with. His photos depicting “dramatic enactments of violent crimes perpetrated against black Grand Rapidians” explores how violent crimes disproportionately affect the African-American community. Images of mothers crying over their dead sons and women being gunned down in their homes may not sit well with many, but their presence at GRAM’s ArtPrize Seven is notable, and arguably a very important addition to the conversation. Similarly, Jess Dugan’s "Transcendence" wrestles with weighty subject matter as it captures the portraits of individuals who “do not identify themselves as either male or female,” a portion of the population which the artist feels are “often overlooked or misrepresented.” The essay includes a striking side-by-side portrait of the artist, who has undergone gender transformation, and her mother. The portraits are haunting, and certain to provoke conversation. Scott Hoyle’s "Blue Ribbon" photo essay compiles portraits of National 4-H Best in Breed winners that are impossible not to smile at. They're perhaps not as weighty a subject as other essays, but an agrarian reference that’s right at home in West Michigan, and hold a subtle yet pointed statement on genealogy and identity. Shannon Plumb’s hilarious silent video "Rattles and Cherries" also explores important social issues, as the subject of the video tries desperately to balance seducing the camera with her duties as a mother - roles which she ultimately collapses into one. Armando Ramos’ giant ceramic sculpture "Kind Regards," which will inevitably be nicknamed “the weird giant teddy bear heads,” is certain to polarize audiences. Love them or hate them, but these three giant mischievous sculptures are impossible to ignore. This year’s dark horse medium goes to Paula Kovarik and her "The Thread that Connects," a series of fabric works which include intricate, free-flowing quilted designs. From a distance, these seem elegant and delicate; from up close, one’s gaze is lost in endless patterns of geometric and natural shapes. Each unique in their own way, the GRAM’s ArtPrize works this year are thoughtful, intentional and completely unpredictable - like the theme from which they’re launched. Importantly, there’s relevance here not only to national social issues, but to subjects of frequent discussion in our own Grand Rapids community. There’s plenty in the subject matter of the GRAM’s Nature/Nurture exhibit to debate. Thankfully, it seems that pandering to the popular vote likely won’t be at the top of people’s list of topics this year.